In recent years, the widespread use of mobile devices for information and communication has changed passengers’ expectations about rail travel. In addition to expecting a comfortable journey, passengers are increasingly demanding Internet access and the ability to work onboard a train to make efficient use of their travel time. 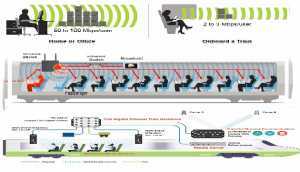 Beyond simple Internet access, railway operators have also begun to recognize that they can leverage onboard Wi-Fi networks to support a variety of operational and passenger infotainment applications. A digitally connected fleet enables real-time system status reporting and better information flow. These services increase operational efficiency, reduce costs, improve service quality, and improve customer satisfaction. Here are the top five factors to consider when choosing a Wi-Fi solution for high-density Wi-Fi deployments in industrial applications—beyond supporting the same standard features as a general-purpose access point (AP). 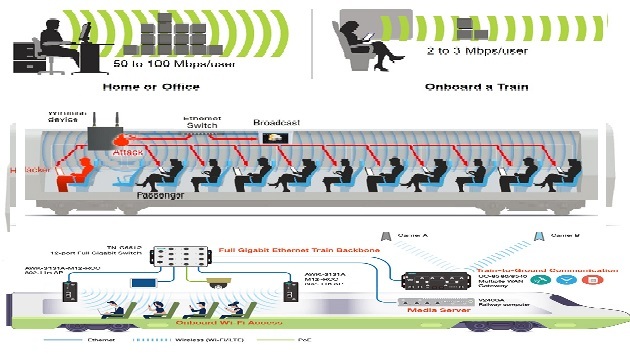 It is difficult to predict how much bandwidth each passenger needs to enjoy seamless network connectivity while travelling. Estimates are usually based on studies that consider user behavior and the bandwidth used by various onboard applications. If a conventional wireless network is deployed in a high-density user environment, it is not hard to predict the result, poor user experience. This is more evident at live events and on trains where hundreds of users are trying to simultaneously access a Wi-Fi network. When too many client devices try to connect to an AP, the bandwidth available for each client device decreases, eventually resulting in poor connectivity. With client-load balancing, railway operators can limit the number of client devices that can connect to an AP. When this limit is reached, the AP can deny any new connection requests, forcing client devices to connect to other APs, thereby sharing the available radio channels evenly among client devices in the area. Railway operators must implement client isolation in a public Wi-Fi network to prevent client devices from communicating with one another; they should be allowed to only access the Internet. This serves two purposes: it increases network security and limits broadcast traffic. Every device that connects to onboard APs belongs to the same network, which includes onboard systems such as broadcast or other control systems.